Iceland’s Reykjavik Energy has awarded a public sector tender to install 15 new fast chargers to ABB. The ’15 Terra’ multi-standard DC chargers (type 53 CJG) will be deployed at various points along Iceland’s main highway and are scheduled to be commissioned by the end of 2017. 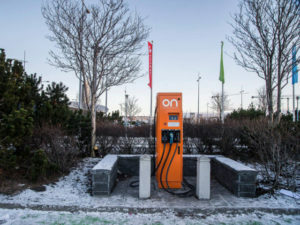 The tender for fast chargers is part of the country’s campaign to promote and expand Iceland’s e-mobility strategy by increasing the availability of flexible and robust charging stations along central locations of the national highway across the entire country. There are currently more than 1,400 electric vehicles on the road in Iceland, helped by a state-financed incentive programme. “Iceland is a progressive country, which introduces new energy standards and makes use of the country’s sustainable energy resources to support its infrastructure,” said Frank Muehlon, head of ABB’s global business for electric vehicle charging infrastructure. “The advantages with this type of fast charger can be found in the multi-protocol design, which supports cloud-based technology. This gives ON Power access to real time data for the remote control and proactive control of the operation and technical status of the charging stations. This gives a fully flexible overview of the entire charging network,” he says, adding that the system is fully functional right down to temperatures of minus 35 degrees.